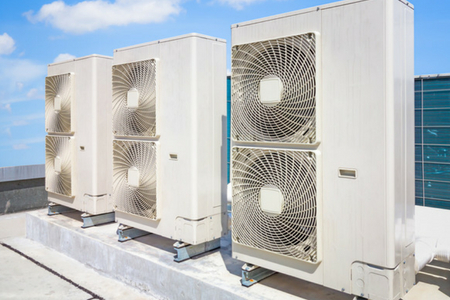 Choosing an industrial air conditioning professional is an essential responsibility for any business owner or property manager. Doing ample research could mean the difference between acquiring a sound, expertly installed heating and cooling unit or an entirely bad and poorly installed one. Today’s competitive commercial and industrial climate suggests the need for employers to keep the workplace as efficient and productive as possible to fulfill their mission and achieve their goals. Thus, the job site’s temperature and workplace productivity are factors that go hand-in-hand as they substantially influence worker outputs. Not all HVAC contractors are qualified. A lot of them are not trained and certified and would just drive around in a truck with a sticker. If you are a business owner or industrial property manager, we’ll help you narrow down the things you should be looking for when hiring an HVAC professional. No two industrial air conditioning systems are the same. A lot of the times, an on-site visual inspection should be conducted for an HVAC contractor to determine the heating and cooling needs of your place or what issues your current unit has and how best to address them. Be wary of contractors offering you bids and estimate over the phone without them ever stepping foot on site and inspecting your facilities. An on-site inspection can tell your contractor about the ducting, the registers, the existing insulation, the type of windows, and so on. None of these factors can be checked through email communication or over the phone. Real HVAC contractors know that time and gas are required for a visit, and they certainly won’t skimp on it. However, once contractor arrives at your worksite, make sure he surveys the entire site properly before you accept a bid or an estimate. Never accept any bids, estimates, or agreements without a sufficiently written version. Any trusted, reputable, and experienced HVAC company will give you a written proposal complete with the contents, specifications, and guidelines both parties agreed to. As you know, be wary of fake online reviews. Some online resources filter reviews, making them not a very good reliable place for choosing an HVAC contractor. One of the things to watch out for are businesses with tons of reviews from fake-looking profiles. In any case, just use your better judgment. Doing a little digging online will significantly benefit you. Additionally, check with other fellow business owners and property managers in your area and ask for their recommendations. “Bargain contractors,” as what we’d like to call them, are the ones offering you the cheapest bid. If you think you’ve come across a great deal, it’s not always the case. An HVAC unit is one of the most important mechanical systems at your work site. It’s not just an ordinary paint job or any other interior or exterior work. Your industrial air conditioning unit is composed of a multitude of parts that are expected to run for 10 to 15 years, or even more. And if your unit is not correctly installed by a qualified contractor, then it will fail altogether, costing you more money in repairs. In the long run, it’s always more economical to go with an experienced, reputable contractor than a cheap one. Apply this mantra when looking for an industrial HVAC contractor: do it right the first time. The simple solution to this predicament is to shop and look around for different local contractors. Get several bids. Talk to multiple HVAC companies and see which one you feel confident in giving your business to. Go with your gut. To sum up, choosing an industrial air conditioning contractor is all about dedicating some time to research and applying common sense. Who you choose to install your heating and cooling unit is just as important, if not more, than what type of unit you get. You can get the latest, most technologically advanced HVAC system with lots of fantastic features, but if the contractor is not trained or certified to install it, then it will just be a wasted investment. We hope this article has been helpful!